Fig. 3: Amplitudes of all single oscillations during a dwell time of 1.4 s and for a frequency of 40 Hz. 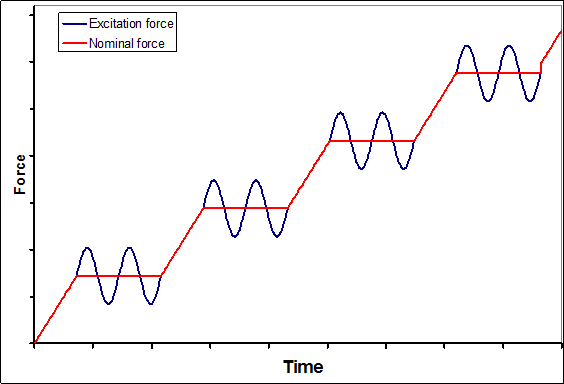 The first 12 of 56 oscillations are not used for averaging because creep effects are largest immediately after reaching the target force. 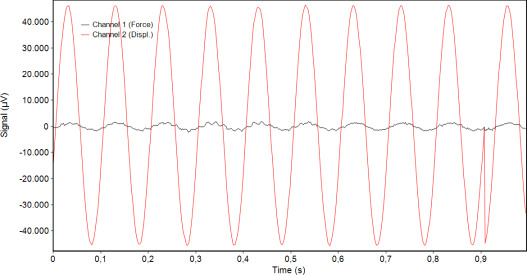 The Continuous Stiffness Measurement (CSM) method, as it was invented by Nanoinstruments more than 20 years ago, adds a continuous small oscillation to the force signal (fig. 1). The ratio of force and displacement amplitude delivers the contact stiffness between indenter and sample after some corrections which consider moving mass, frequency and damping coefficient. In the CSM method is the static force during loading for every oscillation slightly different. This complicates the averaging of several oscillations and the feedback control. The ZHN is also able to measure with the CSM method. ASMEC has developed a somewhat different method which is called Quasi Continuous Stiffness Measurement (QCSM). 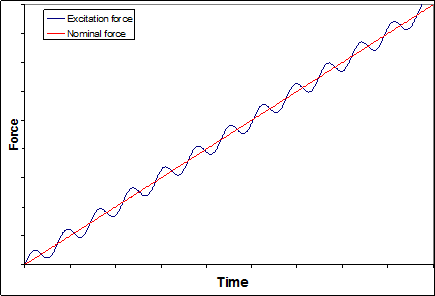 In this method the force is increased in small steps and the oscillation is only switched on during a short dwell time between about 0.5 s and 3 s (see fig. 2). This allows an easy averaging of several oscillations and also the feedback control is more accurate. 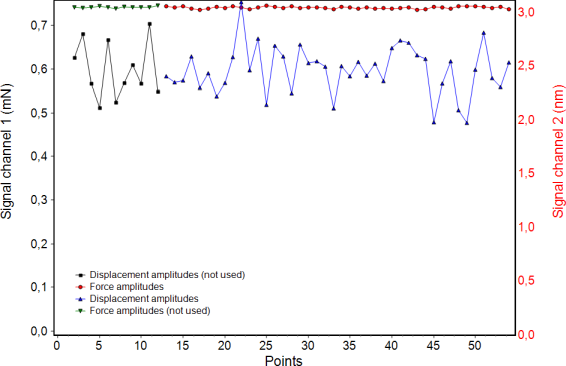 For example there are amplitudes from 56 oscillations measured at a frequency of 40 Hz and a dwell time of 1.4 s. In the QCSM method the first 20 % of the measured amplitudes are not considered for averaging to reduce the creep influence on the results. This is especially important for viscous materials. The accuracy can further be improved by a longer dwell time or larger amplitude. The CSM as well as the QCSM method allow a depth-resolved measurement of hardness and modulus at one and the same position. Therefore much more information can be generated than with normal indentation measurements. The default value for the force step number in a QCSM application is 30. This corresponds to measurements with 30 different forces. 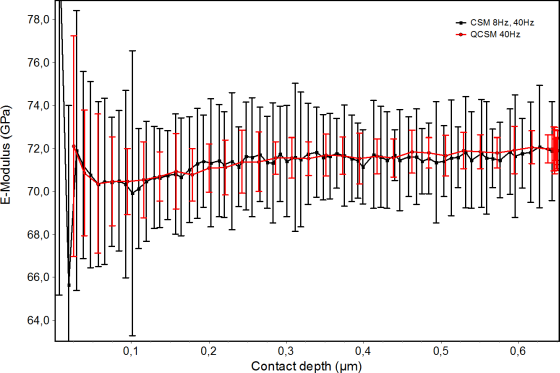 Further the accuracy of QCSM measurements is higher at very small forces. With the 2 N measuring had it is therefore possible to measure accurate data at only 100 µN or 10 nm depth. The results of the QCSM method are independent on the frequency up to about 75 Hz (in dependence on material and indenter shape). This is demonstrated in fig. 4 for fused silica measurements. The curves for the depth-dependent modulus have been obtained by averaging 6 single measurements. The error bars show the statistical error. A more resolved comparison between CSM und QCSM method in fig. 5 shows that the error of the CSM is clearly larger for the same frequency of 40 Hz. A separate application allows a frequency sweep for the determination of the frequency dependent e-modulus of viscous materials. Fig. 6 demonstrates this for the measurement of an elastomer with the name Affinity. In this case correct measurements up to 100 Hz have been possible by using a big ball of 7 mm diameter as indenter. 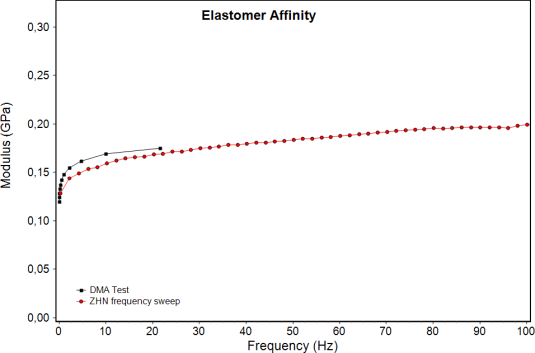 DMA data up to 20 Hz have been available for the same sample so that a comparison was possible. Considering the different contact geometry in an indentation experiment and a DMA test the results agree very well. Another speciality of the ZHN is that quite big force amplitudes of 50 mN or more can be generated during oscillations. This allows fatigue tests even with higher frequencies than 75 Hz because no contact stiffness needs to be calculated. Fig. 7 shows an oscillation of the indenter in air with a frequency of 10 Hz and an acquisition rate of 512 Hz with the oscilloscope function of the instrument software. Always 512 points are used in the graph. Since the data are continuously updated there is always a jump in the curve visible (here at 0.9 s) which does not have any consequences. Fig.4: Comparison of depth dependent modulus curves from CSM and QCSM measurements on fused silica with different frequencies. For the CSM measurement the acquisition rate was 8 Hz and the oscillation frequency was 40 Hz. Fig. 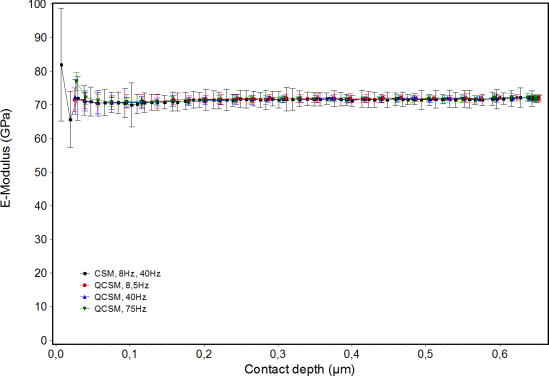 5: Detail from figure 4 as comparison of CSM and QCSM measurements with the same frequency of 40 Hz. These are average curves from 6 single measurements. Error bars give the statistical error. The smaller error for the QCSM method can be recognized. Fig. 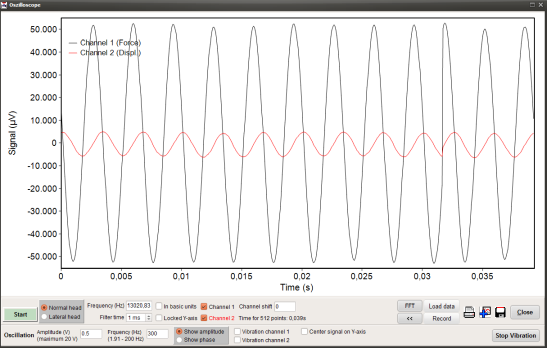 7: Oscilloscope function for an oscillation in air with 10 Hz and an acquisition rate of 512 Hz. Fig. 8: Oscilloscope window for an oscillation in air with 300 Hz and an acquisition rate of 13 kHz. The inert mass of the moving parts result in a significantly larger force signal than displacement signal.